The Union Pearson Express (UP Express) is an airport rail link running between Union Station in Downtown Toronto and Toronto Pearson International Airport. The UP Express began operation on 6 June 2015, in time for the 2015 Pan American Games. The UP Express travels between Union and Pearson in 25 minutes departing every 15 minutes, seven days a week. At the launch announcement, it was stated that the UP Express is projected to carry 2.35 million passengers annually, and eliminate approximately 1.2 million car trips in the first year. UP Express is operated as an independent division of Metrolinx, similarly to GO Transit. An airport rail link was one of the priority projects identified in Metrolinx's regional transportation plan, The Big Move. Construction began in 2011 as part of the Georgetown South Project, which expanded the rail corridor the UP Express shares with GO Transit and Via Rail. UP Express uses diesel multiple unit (DMU) trains that meet United States Environmental Protection Agency Tier 4 emission standards. The Kitchener line and UP Express will be electrified, although no date has been set. The UP Express has been criticized for not using electric trains from the outset, and for its initial fare prices that were high compared with other North American airport–city connections. Improved transit connections to Pearson Airport have been of interest since the late 1980s. Before the specific pursuit of an airport rail link, three formal studies were conducted, and released in 1989, 1990 and 1991. The last two presented options for either making a connection from the GO Georgetown (later extended and renamed Kitchener) train line or the Toronto Transit Commission's (TTC) Line 2 Bloor–Danforth. 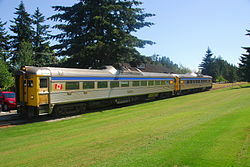 The original Blue22 service proposed by SNC-Lavalin would have used refurbished Budd Rail Diesel Cars. Pictured are two cars used by Via Rail. Transport Canada made a request for proposal for an airport rail link in April 2001. In May 2003, the submissions were pared down to four pre-qualified private consortia, who were then invited to submit business cases. An SNC-Lavalin subsidiary named the Union Pearson AirLink Group was selected as the successful respondent to finance, design, construct, operate and maintain an airport rail link on 13 November 2003. The service was to be called Blue22, as a trip would take 22 minutes to or from Pearson with a stop at the Bloor GO/Dundas West TTC Station. Trains were to be refurbished Budd Rail Diesel Cars, and were expected to begin running between 2008 and 2010. A GO Train operating along the Kitchener line. The UP Express project is combined with the Georgetown South Project, which is improving the infrastructure along the line for future GO Train service and the UP Express. By 2008, there had not been significant progress on the project because of failed consensus in negotiations, regulatory hurdles and community opposition. In June 2008, the Ontario government revised the environmental assessment process from a required three-year period to six months, and later that summer it resumed negotiations with Union Pearson AirLink Group on terms for a public-private partnership. Furthermore, the high-speed link received public statements of strong support from Premier of Ontario Dalton McGuinty, Toronto Mayor David Miller and the federal government. In November 2008, Metrolinx, the Ontario government agency for Greater Toronto and Hamilton transportation, released its Regional Transportation Plan titled The Big Move, outlining how an airport rail link was part of a strategy to establish multi-directional high-order transit connectivity to the Pearson Airport district, in addition to the Mississauga Transitway, rapid transit corridors along Highways 427 and 407, and light rail transit lines along Eglinton and Finch Avenues. In December 2008, Metrolinx became the proponent of new EA that would simultaneously assess a combination of both the UP Express and GO Transit's Georgetown South expansion. The final Environmental Project Report was released on 30 July 2009. After two years of failed negotiations and financing difficulties, the public-private partnership between Ontario and the Union Pearson AirLink Group was called off in July 2010, and Metrolinx was handed responsibility to directly own and operate the service. Metrolinx established the new operating division that would become Union Pearson Express. The name 'Air Rail Link' was used as a placeholder until the official name was unveiled on 29 November 2012. Metrolinx largely preserved the same project scope as had been approved in the environmental assessment, with the service designed for air travellers rather than for conventional commuters. Changes from SNC Lavalin's former proposal included refinements to take into account synergies with GO Transit. In November 2010, the Board of Directors of Metrolinx authorized its staff to enter into negotiations with Sumitomo Corporation of America to supply Diesel Multiple Units (DMUs); the contract was approved by the Board in February 2011 and executed on 31 March 2011. Kathy Haley was named the first president of the division in July 2011. Station construction in the SkyWalk beside Union Station in downtown Toronto. It was announced on 24 October 2011 that the consortium AirLinx Transit Partners had been selected to complete building the UP Express. The consortium comprises some of Canada's largest construction companies such as Aecon and Dufferin Construction. Construction on the spur line and passenger station at Pearson began in the spring of 2012, at a cost of $128.6 million. As of 2010, the entire project was expected to cost C$456 million. Undertaken as part of the Georgetown South Project, the work consisted of five new road overpasses and two road underpasses, one railway grade separation, one bridge reconstruction and the widening of 15 other bridges, construction/re-construction of four stations, major track and grading construction, signal installations utility relocations, as well as the new 3.3 km elevated spur to and from the airport. This work was conducted while minimizing disruption to existing train operations, local residents and businesses. A new rail tunnel under Highway 401 is still required at a later date to meet future ridership demands. Service began on 6 June 2015, operated by the Union Pearson Express division of Metrolinx. 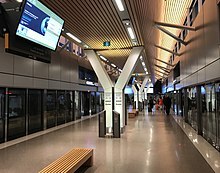 With an adult one-way fare of $27.50 cash or $19.00 with a Presto card, the service was criticized for being the most expensive airport rail link service in North America; the fare was later reduced. During the 2016 Family Day weekend, the Union Pearson Express offered free rides to everyone. It resulted in lineups approximately two hours long at both ends of the line as more than 28,000 passengers took advantage of the opportunity. A new fare structure was introduced on 9 March 2016, which reduced the one-way ticket price between Union and Pearson from $27.50 to $12.00 cash, and from $19.00 to $9.00 with a Presto card. The change also introduced GO pricing between Bloor/Weston and Union stations. There is a $1.50 discount for passengers transferring to the TTC after their ride. President Kathy Haley stepped down on 31 March 2016, and Metrolinx announced that it was conducting an organizational review. Union Pearson Express operates daily between 5:30 am and 1:00 am every 15 minutes, making approximately 140 trips per day. From Union Station, the UP Express heads northwest along the existing GO Transit Kitchener line. This 22-kilometre (14-mile) section of track between Bathurst Street and Highway 427 was upgraded as part of GO's Georgetown South Project, which improved infrastructure along the route to accommodate the UP Express, GO Transit, Canadian National, and Via Rail services. The UP Express makes two intermediate stops at Bloor and Weston GO stations. Bloor Station was redesigned for better access and connection to GO Transit, and Metrolinx is working towards a future direct connection to the Dundas West subway station. Beyond Highway 427, a newly constructed 3.3 km (2.1 mi) rail spur carries the UP Express from the Kitchener line to the airport, forming the longest elevated rail line in Ontario. The elevated spur to Pearson Airport reaches a maximum height of 28 metres (92 feet), offering a view of the Downtown Toronto and Mississauga City Centre skylines. At Pearson, the UP Express arrives at Terminal 1, where riders can connect to the existing Link Train inter-terminal shuttle to Terminal 3 and the Viscount parking garage. At Toronto Union Station, UP Express departs from a newly constructed station immediately west of the railway station of the same name, connected to it by the SkyWalk. The UP station features numerous amenities including a fully enclosed platform and waiting area, a guest services desk, a café, a gift shop and a licensed lounge. Whereas other GO Transit lines use low-floor vehicles accessed from low-level platforms, the Union Pearson Express is operated with high-floor vehicles necessitating high-level platforms. As a result, at Bloor and Weston stations, UP operates from its own dedicated platforms adjacent to the Kitchener line platforms. It is proposed to put a stop at Mount Dennis station to connect with the under-construction Line 5 Eglinton, to be opened in 2021. The Union Pearson Express uses Nippon Sharyo DMU trains. The fleet consists of 18 diesel multiple unit (DMU) cars, as four three-car and three two-car sets. On 1 March 2011, Metrolinx announced that it had chosen to buy 12 DMU cars (six two-car trains) from Nippon Sharyo at a cost of C$53 million, for the service. This was later expanded to 18 DMU cars (adding one car to each train) via an option order. This brought the cost to US$75 million. The DMUs were manufactured in Japan, assembled in Nippon Sharyo's facility in Rochelle, Illinois, and towed by rail to Toronto, with the first trainset arriving on 15 August 2014. The trainsets seat between 115 and 173 people. On-board features include power outlets, Wi-Fi, luggage facilities, and washrooms. The UP Express DMUs are based on the design created for the Sonoma–Marin Area Rail Transit system in California. Powered by a diesel hydraulic drive with a six-speed automatic transmission and regenerative braking, the DMUs are believed to be the first trains in the world that comply with the United States Environmental Protection Agency Tier 4 emission standards, which will reduce emissions up to 90%. Braking energy is converted into electricity by the auxiliary power generator, and helps to provide onboard lighting and heating. They also comply with FRA Tier 1 crash energy management features. 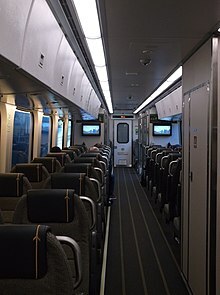 Modifications for UP Express use include enclosed overhead luggage bins that comply with Transport Canada rules and an enhanced enclosed luggage tower. The Tier 4 engines produce substantially lower emissions than most other diesel vehicles in Toronto. The Environmental Impact Assessment for the UP Express of 2009 was carried out assuming that trains would be Tier 3 standard rather than Tier 4, and showed that at peak frequency the air quality effect of the additional trains would not raise any pollution level above the provincial criterion levels. The 2010 Metrolinx electrification study, which did assume the use of Tier 4 emissions technologies for diesel propulsion options, found that the Georgetown/UP Express diesel service would contribute on the order of 0.2% to local air pollution, and that electrification would result in only a small improvement to local air quality. 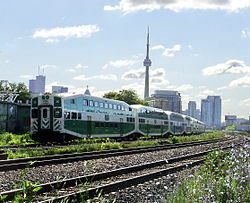 In an additional review of human health assessment in 2011, GO Transit examined the current plan for Tier 4 emission controls on both the UP Express trains and conversion of existing GO locomotives to Tier 4 and found that the human health risks of the diesel UP Express service are negligible, but that current background air quality (from other pollution sources in Toronto) is an issue. Fares are based on age, origin and destination, and the method of payment. Discounts are available for families, round trips, and airport staff. As with other GO Transit lines, integrated train tickets can be purchased through Via Rail to railway stations across Canada. Upon launch, one-way fares on the UP Express between were $27.50, or $19 with a Presto card. By 19 June 2015, the Union Pearson Express was averaging about 3,250 riders a day, or 12 percent capacity. Metrolinx has projected that a year after opening, the service will attract 5,000 riders a day — about 1 million customers. By 2020, Metrolinx expects about 2.46 million rides per year will bring it up to full operating cost recovery. However, ridership declined in the service's opening months. Ridership in August 2015 was 17 percent lower than in June 2015 and a further 4 percent lower in the first two weeks of September. Ridership ended up averaging 2,300 per day during a four-week period in September 2015, a drop of 29 percent since June. The service needed about 7,000 riders per day to break even on operating costs. A report in February 2016 showed a drop in monthly ridership from the summer to 65,593 rides (just over 2,100 per day) in November 2015. This led Metrolinx to start considering price adjustments to boost ridership numbers. By January 2016, average ridership slumped further to 1,967 passengers per day. Fares were reduced on 9 March 2016 to $12 for a one-way trip between Union and Pearson, or $9 with a Presto card. On the first day of reduced fares, staff counted 5,300 boardings with 40 per cent of the riders being first-time UPX users, 83 per cent being air travelers and 17 per cent being commuters. By June 2016, the daily average ridership had risen to 7,657, and a new record was set on 29 July, when the service carried more than 11,000 passengers. However, the fare reduction has lowered the total revenue collected by the UP Express, which is expected to be below what is required for its operating costs. It was revealed that since opening day to March 2016, the UP Express' provincial operating subsidy totaled $39.3 million or about $52.26 per ride. In July 2017, the most recent month for which patronage data is available, the UP Express carried an average of 10,091 passengers daily. 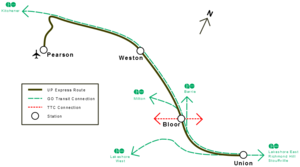 Residents living along the Weston section of the route have objected to alterations to accommodate the GO Georgetown South corridor improvements and the addition of UP Express trains. Concerns include the division of Weston from the closing of level crossings, noise levels, air quality and property values. In April 2009, the Clean Train Coalition (CTC), representing the communities along the rail corridor, formed to put pressure on Metrolinx and the province to immediately prioritize electrification of the densely populated Georgetown South corridor and Union-Pearson Rail Link on opening day. However, both the province and Metrolinx Chairman Rob Prichard have indicated that using diesel trains is the only way to prevent significant delays. "We believe the Greater Toronto Area needs this project as fast as possible, and that means going with the cleanest diesel technology in the world," stated Prichard. In August 2012, the CTC took legal action against Metrolinx by submitting an application for judicial review. The application requested "quashing and setting aside any decision to implement or run Diesel Multiple Units along the Air Rail Link", on the basis that by taking direction from the Ontario government to complete the UP Express in time for the Pan American Games, a proper analysis between operating diesel and electric trains was not completed, running contrary to Metrolinx's legislated mandate. It also asserted that another review of air quality was warranted due to the World Health Organization's (WHO) reclassification of diesel exhaust as a carcinogen. Saba Ahmad, the lawyer representing the CTC, described the application as a test of whether government agencies must obey their own legislation. On 21 November 2012, the Ontario Divisional Court turned down the application, and ordered the CTC to pay $30,000 in court costs. The Toronto Transit Commission (TTC) service offers a frequent express bus route, the 900 Airport Express, between Kipling station and Pearson. Buses depart every 10 minutes or less, and a trip from downtown to Pearson Airport takes 45 minutes for the cost of a TTC fare ($3.25 cash, $3.00 with token or Presto card). From 1993 until 2014, the Toronto Airport Express was a privately operated airport bus service from the airport to downtown Toronto operated by Pacific Western Transportation. The route was founded by Gray Coach in 1979. As of 2012, a "One Ride Scheduled Service" to or from downtown Toronto cost $26.95 and a "One Ride On-Demand Airport Express Connect" fare cost $29.95. A one-way trip took approximately 45 to 90 minutes, depending on traffic. The service ceased operation on 31 October 2014 due to declining ridership, popularity of the Billy Bishop Airport on Toronto Island, delays due to downtown road construction, and anticipated competition from the Union Pearson Express. Other public transit bus services are operated by Toronto Transit Commission, GO Transit, MiWay, and Brampton Transit, connecting Pearson Airport to the City of Toronto and other cities in the Greater Toronto Area. ^ a b "Passenger ridership" (PDF). Metrolinx. 13 September 2017. ^ a b c "Union Pearson Express to Launch June 6". Government of Ontario. Retrieved 22 April 2015. ^ "Georgetown South Projected Train Volumes and Speeds" (PDF). GO Transit. Archived from the original (PDF) on 29 October 2013. Retrieved 24 October 2013. ^ a b "Metrolinx Unveils Next Wave of Big Move Projects". CNW Newswire. 29 November 2012. Retrieved 29 November 2012. ^ a b c d "Georgetown South Project". GO Transit. Archived from the original on 4 August 2011. Retrieved 7 August 2011. ^ The Canadian Press (22 April 2015). "Union Pearson Express to launch June 6". Toronto Star. Retrieved 22 April 2015. ^ "UP Express Information". Toronto: UP Express. 28 October 2013. Archived from the original on 3 December 2012. Retrieved 30 November 2011. ^ "The Big Move". Metrolinx. 2008. Archived from the original on 27 February 2009. Retrieved 6 December 2012. ^ "The Air Rail Link (ARL) - Fact Sheet" (PDF). Metrolinx. Archived from the original (PDF) on 22 March 2014. Retrieved 27 November 2012. ^ Kalinowski, Tess (19 August 2011). "Metrolinx ad ruled 'misleading' on electrification". The Toronto Star. Toronto. Archived from the original on 19 December 2011. Retrieved 30 August 2011. ^ a b Clean Train Coalition Inc. v. Metrolinx , 380/12 2 August 2012 (Ontario Superior Court of Justice). ^ a b Mackenzie, Robert (11 August 2012). "Clean Train Coalition seeks judicial review to stop diesel trains along Air-Rail Link". Transit Toronto. Retrieved 11 August 2012. ^ a b "Is Toronto's air-rail link the priciest in North America?". BlogTO. Retrieved 4 December 2014. ^ a b c d "Environmental Project Report – Georgetown South Service Expansion and Union-Pearson Rail Link" (PDF). Toronto: Metrolinx. 30 July 2009. Archived from the original (PDF) on 7 April 2012. Retrieved 7 August 2011. ^ a b "Backgrounder 2 – Union Pearson Airlink Group's Blue22 Service" (PDF). Transport Canada. 13 November 2003. Retrieved 8 August 2011. ^ "Transport Minister Announces Winning Proposal for Toronto Air-Rail Link" (Press release). Ottawa: Transport Canada. 13 November 2003. Archived from the original on 30 November 2011. Retrieved 30 November 2011. ^ a b Boyle, Theresa (5 August 2008). "High-speed rail link to airport on fast track". The Toronto Star. Toronto. Archived from the original on 30 November 2011. Retrieved 1 August 2011. ^ CNW Group (15 December 2008). "Metrolinx is new proponent of Georgetown Line". CNW Group. Retrieved 29 April 2010. ^ a b Kalinowski, Tess (31 July 2010). "Province vows rapid rail link to Pearson by 2015 Pan Ams". The Toronto Star. Toronto. Archived from the original on 30 November 2011. Retrieved 8 August 2011. ^ CNW Group (30 July 2010). "Metrolinx to build, own and operate Air Rail Link". CNW Group. Archived from the original on 1 January 2013. Retrieved 8 August 2011. ^ a b c "Air Rail Link Service:Pearson to Union". Toronto: Metrolinx. 16 November 2010. Archived from the original (PDF) on 30 November 2011. Retrieved 30 November 2011. ^ Ontario Superior Court (21 November 2012). "Clean Train Coalition Inc. v. Metrolinx, 2012 ONSC 6593". Canadian Legal Information Institute. Retrieved 3 December 2012. ^ "Key Dates". Toronto: Union Pearson Express. Archived from the original on 3 December 2012. Retrieved 3 December 2012. ^ CBC News (24 October 2011). "Toronto's airport rail link to be built by consortium". CBC. Retrieved 7 December 2011. ^ "Financial Close Reached on Three-Kilometre Air Rail Link "Spur Line" and New Passenger station Project". Government of Ontario. 19 December 2011. Retrieved 19 December 2011. ^ a b Ferguson, Rob (19 December 2011). "Construction to start in spring on airport rail link". The Toronto Star. Toronto. Retrieved 7 March 2012. ^ a b "The UPE Project". Metrolinx. Retrieved 16 January 2013. ^ "Georgetown South Project - Project". GO Transit. Retrieved 23 April 2015. ^ "UP Express a huge hit — when it's a free ride | Toronto Star". Thestar.com. 15 February 2016. Retrieved 12 May 2016. ^ Kalinowski, Tess; Benzie, Robert (23 February 2016). "UPX to slash fare by more than half". Toronto Star. Retrieved 23 February 2016. ^ "PRESTO Fare System". TTC.ca. Retrieved 20 July 2018. ^ Oliver, Moore (2 March 2016). "Union Pearson Express head to be removed from role". The Globe and Mail. Toronto. Retrieved 9 May 2016. ^ a b "UrbanToronto Rides the Union Pearson Express". Urban Toronto. 26 May 2015. Retrieved 26 May 2015. ^ a b "Air Rail Link". Metrolinx. Retrieved 7 March 2012. ^ "GO Transit Bloor GO Station Construction Update". Go Transit. Retrieved 9 March 2014. ^ a b "UP and Coming - UP Express: Operational Readiness Update" (PDF). Toronto: Metrolinx. March 2015. Retrieved 4 March 2015. ^ "Georgetown South Project – Ail Rail Link". Toronto: GO Transit. 30 November 2011. Archived from the original on 30 November 2011. Retrieved 30 November 2011. ^ a b c Kalinowski, Tess (9 March 2015). "UPX offers 'clean' train ride with a view". The Toronto Star. Retrieved 9 March 2015. ^ "Union Pearson Express fares to be announced, as planned, Metrolinx tells coalition". Insidetoronto.com. 4 December 2014. Retrieved 12 May 2016. ^ a b "The Vehicles". Union Pearson Express. Archived from the original on 3 December 2012. ^ "Metrolinx orders DMUs to work airport rail link". Railway Gazette. 1 March 2011. Archived from the original on 1 March 2011. Retrieved 1 March 2011. ^ Stephen C Host (15 August 2014). "Toronto airport express trains arrive in Canada". Railway Journal. Archived from the original on 16 August 2014. Retrieved 16 August 2014. THE FIRST two of 18 DMU cars being supplied by Sumitomo to Toronto transport authority Metrolinx for use on the Union Pearson Express (UP Express) airport rail link have arrived in Canada. ^ "NEWS AND MEDIA - 2014 August". Union Pearson Express. Retrieved 16 February 2016. ^ "SMART Technical Specification for Diesel Multiple Units" (PDF). 20 January 2010. Archived from the original (PDF) on 6 June 2014. ^ "Georgetown South Project FAQ's, 'GO Transit'". Retrieved 1 September 2012. ^ "AIR QUALITY ASSESSMENT GEORGETOWN SOUTH SERVICE EXPANSION & UNION PEARSON RAIL LINK TORONTO, ONTARIO, RWDI Consulting Engineers & Scientists'" (PDF). July 2009. Archived from the original (PDF) on 4 July 2015. Retrieved 1 September 2012. ^ "Appendix 9, Multiple Category Evaluation - Findings and Conclusions, Metrolinx" (PDF). December 2010. Retrieved 1 September 2012. ^ "Georgetown South Project Additional Review of Human Health Assessment – Executive Summary" (PDF). GO Transit. 2 June 2011. Archived from the original (PDF) on 4 July 2015. Retrieved 2 September 2012. ^ "UP EXPRESS: FARE STRUCTURE AT A GLANCE" (PDF). Metrolinx. Archived from the original (PDF) on 6 June 2015. Retrieved 22 April 2015. ^ "Union Pearson Express". VIA Rail. 3 November 2014. ^ Yuen, Jenny (17 July 2015). "Tourists not taking to Union-Pearson Express during Pan Am Games: Transit group". Torontosun.com. Retrieved 12 May 2016. ^ "Union Pearson Express hits ridership targets but can be tough to find, survey of riders finds". Toronto Star. 24 June 2015. Retrieved 25 June 2015. ^ Oliver Moore (26 September 2015). "Metrolinx's reputation on the line with poor figures for Pearson express train". Globe and Mail. Retrieved 26 September 2015. ^ Kalinowski, Tess (5 February 2016). "Ridership has dropped since the Union Pearson Express launched in June, the latest numbers show". The Toronto Star. ISSN 0319-0781. Retrieved 8 February 2016. ^ Torontoist (18 October 2016). "Ridership Has Tripled on Toronto's Union Pearson Express". Torontoist. Retrieved 19 April 2017. ^ Tess Kalinowski, Transportation reporter (17 March 2016). "Union Pearson Express ridership spikes after fare reduction". Toronto Star. Retrieved 17 March 2016. ^ Marshall, Sean (18 October 2016). "Ridership Has Tripled on Toronto's Union Pearson Express". Torontoist. ^ Oliver Moore (17 April 2016). "Union Pearson Express can't break even at lower fare, report finds". Globe and Mail. Retrieved 10 February 2017. ^ "Union Pearson Express ridership up, but still heavily subsidized". Toronto Star. Retrieved 27 May 2017. ^ "UPX airport train subsidized $52 per ride last year". Toronto Star. Retrieved 27 May 2017. ^ "Court clears way for diesel trains on new Pearson route". CBC. 21 November 2012. Retrieved 22 November 2012. ^ "Service to Toronto Pearson International Airport". Toronto Transit Commission. Retrieved 10 February 2017. ^ "192 Airport Rocket". Toronto Transit Commission. Retrieved 10 February 2017. ^ "Fares". Toronto Airport Express. Mississauga, Ontario: Pacific Western Transportation Ltd. 2011. Archived from the original on 30 November 2011. ^ "Toronto Airport Express bus to stop service this fall". Toronto Star. 14 June 2014. Retrieved 14 June 2014. ^ "Public Transportation". GTAA.com. Retrieved 3 January 2013. 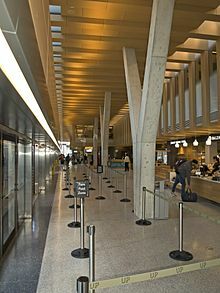 Wikimedia Commons has media related to Union Pearson Express.